This version of my pork belly recipe takes several hours but is very easy if you have a slow cooker/crockpot. The flesh will be tender and juicy. Serve with Asian Slaw and Apple Sauce. Make your Apple Sauce simply by boiling diced apple (skin and all), in a little water until soft and blend before serving. Place pork belly in the Slow Cooker and set on 'Low'. Cook around 7 hours or until the pork is tender and falling apart (alternatively if the pork belly is still frozen set the Slow Cooker on 'High' for the first 3 hours of cooking before turning the cooker to 'Low' for reminder of cooking time). 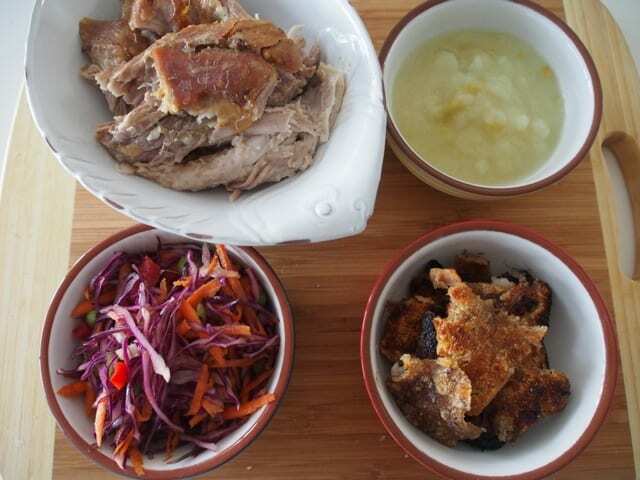 Remove from the Slow Cooker and slice of the rind or layer of fat from top of pork belly. Return flesh to the slow cooker. Place pork rind or fat layer under the grill for around 10 minutes to complete the crackling process. Watch carefully throughout as this will burn very quickly. What spices/herbs do you add to the pork belly when cooking?